A few days ago I drove to Hartford, Connecticut for the 38th Annual Connecticut Flower and Garden Show. It was the best in years. Outstanding exhibits made the trip worth while. Aqua Scapes included a nine-foot stairway waterfall that seemed to drift from the clouds. The title of the exhibit “Stairway to Heaven” said it all. 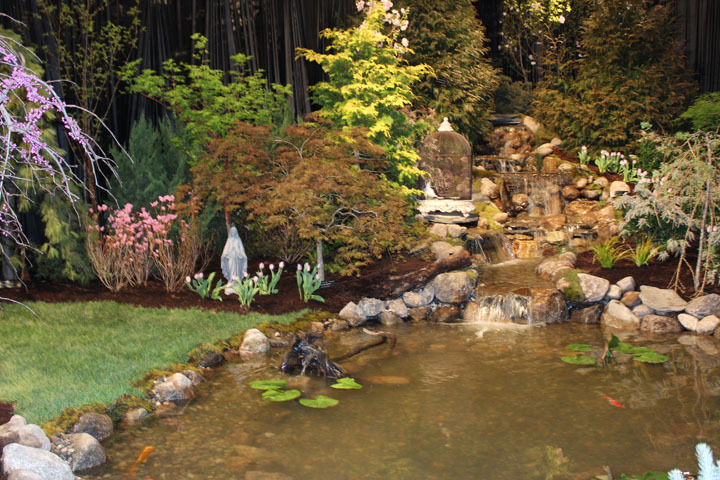 It was truly a heavenly site with its many spring trees, shrubs, bulbs, and perennials. Large stones filled much of the space. In the distance you could see a madonna statue, centered under a Japanese maple and surrounded by a bed of tulips. A large cage next to the water fall housed a white dove. It was no surprise that this exhibit by Aqua Scapes won the Best of Show Award. Another fine exhibit also deserves mention. 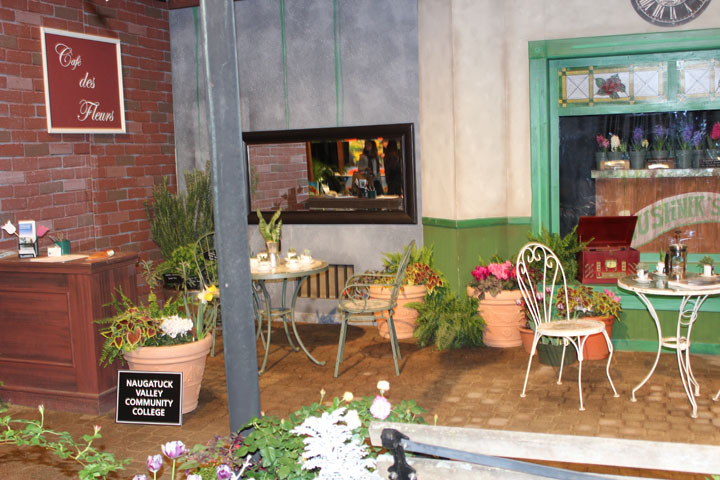 The Naugatuck Valley Community College presented a landscape design that transported you to downtown Paris in the spring. A coffee shop called Cafe des Fleur stood to one side. Ten Horticulture students designed this exhibit. They grew the plants in the College’s greenhouse. An apartment building stood next door to the coffee shop. The building’s entrance included several plants as well. This beautiful exhibit was a simple statement of how flowers can enliven a sidewalk scene. My drive was well worth the time it took to reach Hartford. We gardeners like to think we are original in planning and installing a garden space. In an environment of newspapers, magazines, books, and, of course, social media that is not possible because we are surrounded by media messages in both advertising and editorial content. Since the 1890s the media have become the major influence on our ideas about gardening. At the end of the nineteenth century people wanted standardized products that came from the nation’s factories, whether clothing, shoes, or food. 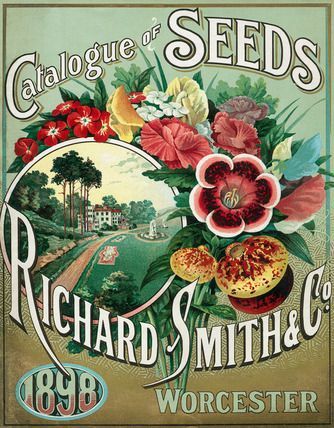 Even seed company and nursery owners illustrated their large operations in a chromolithograph included in the pages of the catalog. A customer could then see the trial fields, the building which made boxes for the company’s many orders, and, of course, the multi-storied factory that served as the seed company or nursery headquarters. People didn’t want just any oat meal. 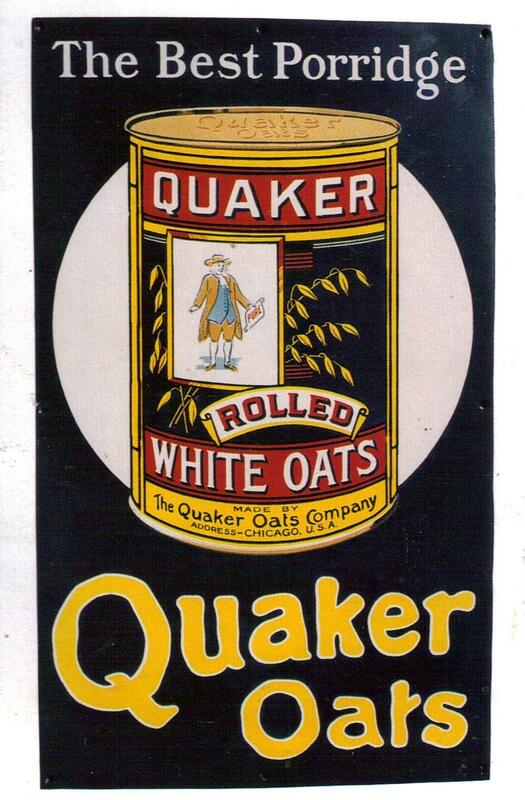 They wanted Quaker Oats. And they got that, and lots of other standardized products. 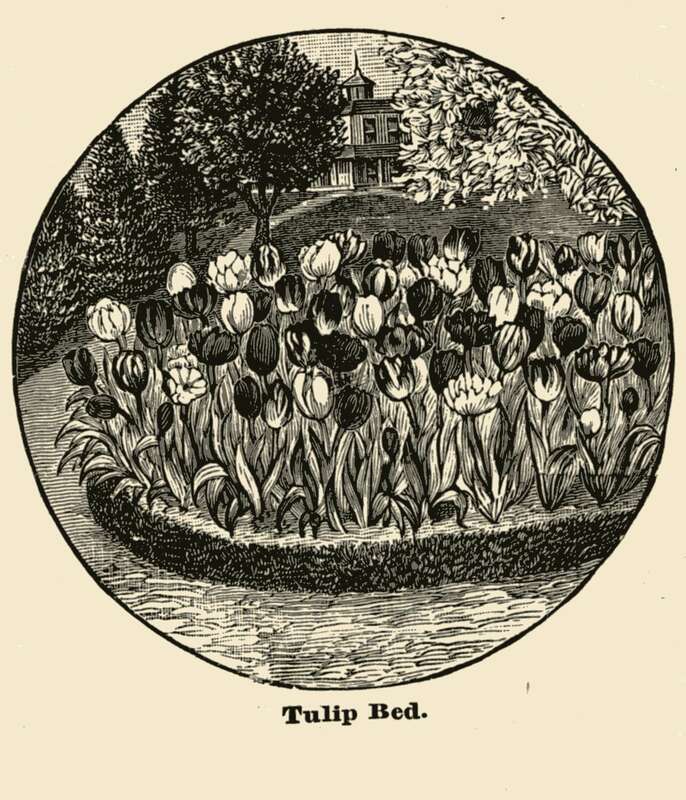 People also wanted a garden like the one illustrated in the garden catalog, which spread across the country in the millions from the many seed companies and nurseries, operating as the modern business they had become. No surprise then that the yearly catalog from the seed company or nursery helped people to choose seeds and bulbs for the flower garden. This Smith catalog from Worcester, Massachusetts in 1898 provides an example from that period of the vibrant Victorian garden. Because everyone was ordering the same seeds and bulbs there was a certain sameness in plant choice and garden design. People wanted to conform to the norms of the culture. 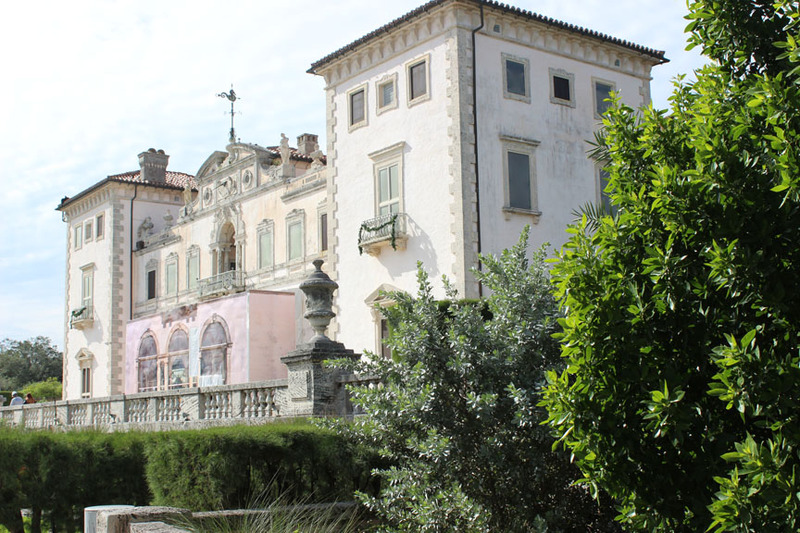 Thus standardized gardens appeared everywhere. It reminds me of the ‘ready garden’ you can buy today. All the seeds are embedded in a cloth that you simply lay on the prepared soil and water. Not only has the garden vendor given you a garden. That person has also provided the design and the seeds. All you need to do is water and watch it grow. The colonial era along the East coast set a landscape design pattern for the middle class, or worker class, in the decades that followed. A certain kind of nineteenth century middle class home landscape appeared mostly in rural or farm areas. The vegetable and herb garden was close to the house just where the first colonists located it as well. 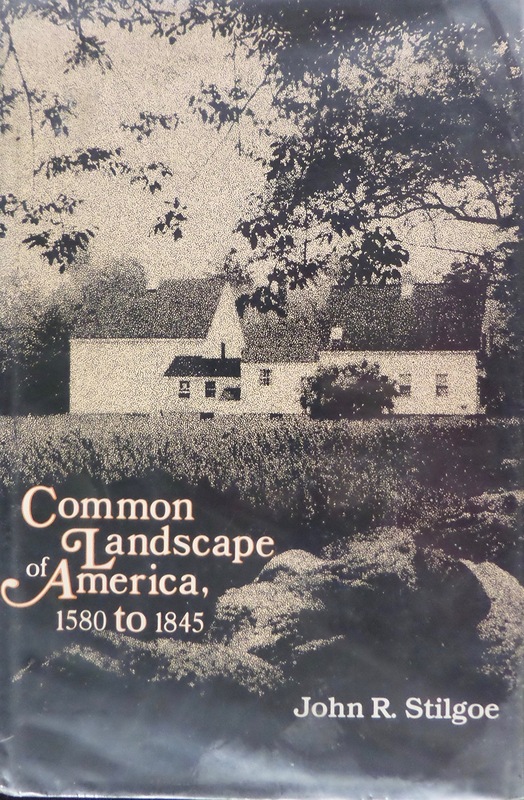 Historian John Stilgoe wrote a wonderful book about the history of home landscape in America called Common Landscape of America, 1580-1845. At that time most people lived on farms or in rural areas. Their home landscape was more utilitarian than the elaborate designs of that period at the country homes of more wealthy Americans. It was owning a single family home that became important to the nineteenth century middle class. Clifford Edward Clark, Jr. refected that same idea in his book, The American Family Home, 1800-1960. In the Introduction to his book Clark commented on what motivated him in writing the book. Once people became home owners, the way the home landscape was to look became important to reflect tradition and what neighbors included in their own yards. The kitchen garden near the house, an idea inspired by the early colonists, continued in that middle class home landscape design. 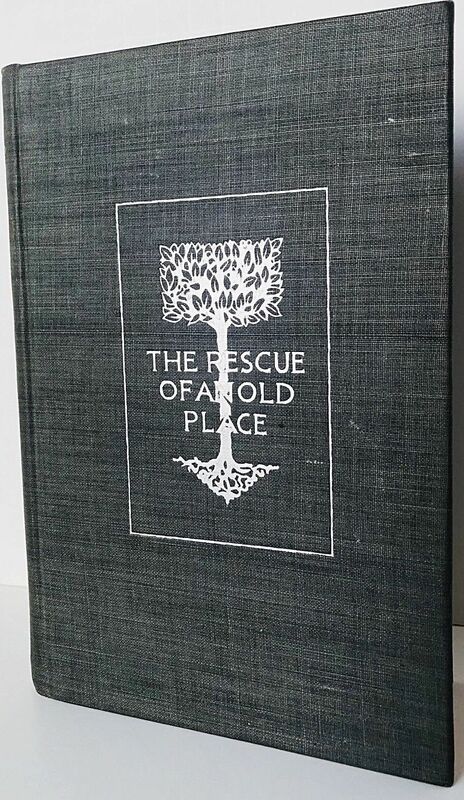 Recently I finished reading a book, published in 1892, called The Rescue of an Old Place. 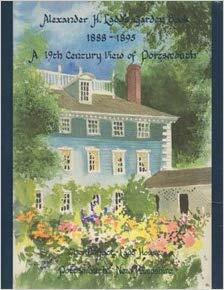 The book traces the journey of a late nineteenth century couple to renew a Victorian garden. The author, Mary Caroline Robbins, tells the story of discovering the home and renewing its landscape in Hingham, Massachusetts, not too far from where I live. She and her husband purchased the property in the early 1890s. She could see the potential in the landscape, though it had long been neglected and seemed to be crying out for attention. Their house sat on four-acres along Winter Street. On a recent visit to Hingham I drove down Winter Street. Though I could not find the house, I saw the contours of the land along each side of the street. I also noticed that part of the street bordered on a marsh with water that came from the near-by ocean. Hingham is a town along the coast that attracts people who covet a quaint New England seacoast town. The book devotes a great deal of space to the poor condition of the trees and shrubs as well the garden. As I was reading it, I could see how clearly the author wanted to make the landscape attractive. She sought to save much of the existing plantings, identifying much that she found on the property. But it was the long-neglected Victorian flower garden that called out to her. She restored it with popular Victorian perennials and annuals. Though a garden may decline and even cease to exit because of neglect, some form of regular maintenance will preserve a gardener’s work for a long time, even generations. Gardeners know the challenge so well. Alexander Hamilton Ladd (1815-1900) lived in a colonial mansion on downtown Market Street in Portsmouth, New Hampshire. William Whipple, an eighteenth century relative and the original owner of the house, had signed the Declaration of Independence. A horse chestnut that Whipple planted in 1776 when he returned from the signing in Philadelphia still stands in the front to the side of the house. Today, however, A. H. Ladd is remembered primarily for his garden in the back of the property. Ladd kept a journal of his work of many years in the garden. The journal, discovered only in 1990, became a book simply titled Alexander H. Ladd’s Garden Book 1888-1895: A 19th Century View of Portsmouth. It recounts his love of gardening. After many years of working in the garden Ladd reflected on how much the garden meant to him. In a letter to his son William dated Saturday, November 16, 1895 Ladd wrote about the pleasure the garden had given him for so many years. Very simply stated, isn’t it? He enjoyed gardening because of the pleasure it gave him. Ladd planted thousands of tulips every Fall. He dug them up after blooming and stored them for planting later for the next spring. His love of gardening included dark moments as well. These are moments when you ask yourself, is it all worth it? He gardened, inspite of dark moments, because of the pleasure it gave him. 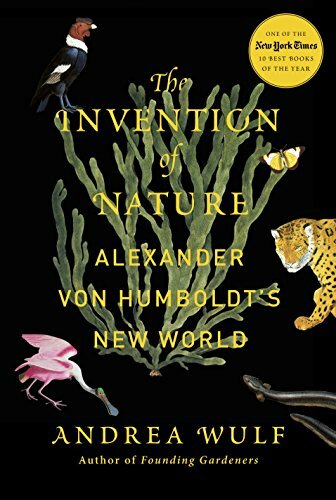 I just can’t say enough about Andrea Wulf’s book on Alexander Von Humboldt (1769-1859) called The Invention of Nature: Alexander Von Humboldt’s New World. As a retired professor of Communication Studies, I was happy to read her comments on Humboldt’s brother Wilhelm and the latter’s theory about language. Wilhelm was an educator, interested in ideas and the pursuit of knowledge. He identified the purpose for language as much more than simply a vehicle for the writer or speaker to formulate an idea. Language, he said, shapes the way we look at the world. The way we talk about plants is the way we relate to them. For example, as soon as you hear the word ‘succulent’ you probably have a general idea of the kind of plant it is and perhaps its growing habit as well as water and light needs. I heard recently from a young gardener that succulents are in today. Just the mention of the word can make people who are into plants come up with their ideas of the best and worse ways to deal with this group of plants. There were several beds and borders that included this Sansevieria. It has a beautiful green color with cream edging. Thus it can add color and structure to the landscape. The word ‘succulent’ applied to the genus ‘Sansevieria’ told me what kind of plant it was. 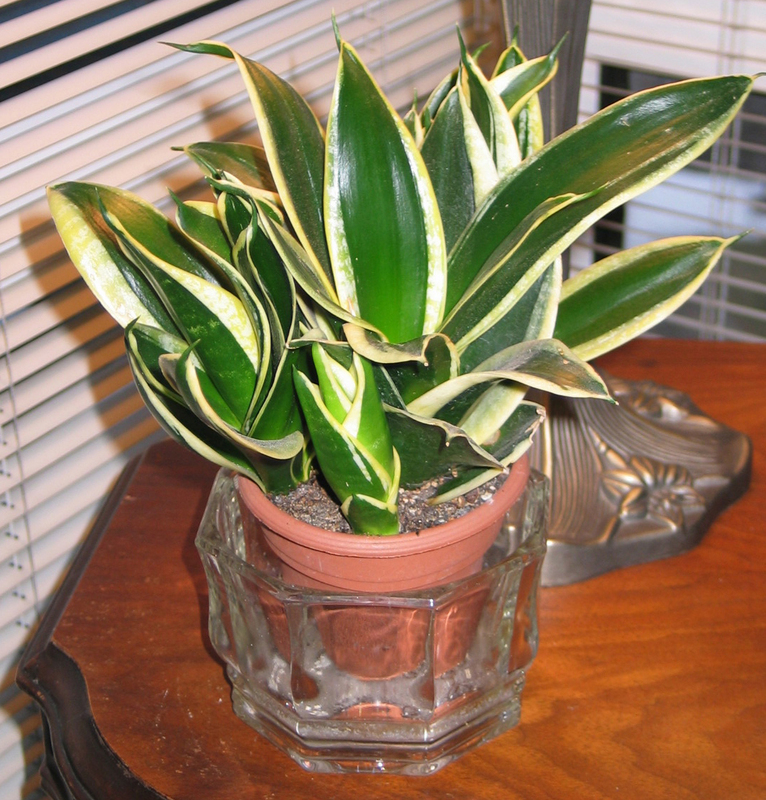 “Sansevieria ‘Black Star’ is an easy-to-grow, double-duty (indoors or outdoors), exotic-looking plant that thrives on neglect. Tolerates low humidity. Tolerates low water and low feeding. Tolerates being root bound. Few if any plants are as foolproof to grow. The word ‘ succulent’ can mean, as it does for me, Sansevieria. Wilhelm’s theory about language helps gardeners to see and deal with the world of plants. In reading garden history books, both old and new, I often came across the name Alexander Von Humboldt (1769-1859). He was a nineteenth century German plant hunter, explorer, and scientist. Humboldt became an early environmentalist. He saw plants, animals, rock, soil, and water as all connected. We, as he often wrote, are one with the world around us. When I found out one of my favorite garden authors Andrea Wulf had written a book about Von Humboldt, I searched the local library and found it. The title of her book is The Invention of Nature: Alexander Von Humboldt’s New World. Humboldt gave us a new meaning for nature. He journeyed to Latin America from 1799 to 1804 with French botanist Aime Bonpland. Together they climbed, walked, and just observed nature wherever they could. He had created a new vision of nature from his travels in Latin America. Today when we face so many issues about what to do about the state of the environment, Humboldt provides much insight for the direction we need to take. We need to use our imagination, he wrote, to begin to address any solution. Nineteenth century botanical art book illustrated social status. Botanical art reveals wondrous details about plants through the eyes of the artist. Once interest in the study of botany took off in the eighteenth century, especially with Linnaeus’ triumph in coming up with a system to categorize plants, botanical art also grew. The English physician Robert John Thornton (1768-1837) became interested in botany and made botanical writing his career. In 1807 Thornton published a book of botanical art with the title New illustration of the sexual system of Carolus von Linnaeus. He wanted to promote the work of Linnaeus who distinguished plants by their method of reproduction. The subtitle was Temple of Flora. The book became an important nineteenth century example of botanical art as well social status. 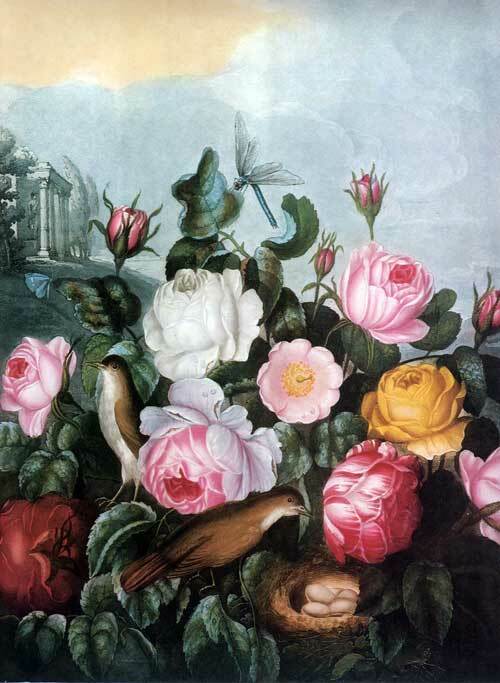 King defines ‘florilegium’ as a book with portraits of flowers included for their ornamental value. Access to works of botanical art during Thornton’s time was restricted to the more educated and wealthy. Eventually by the early twentieth century when printing became cheaper and mass education was the norm, books of botanical art were available to everyone.